OK, so you’ve decided that an AWD or SUV is the right sort of vehicle for you. This could be because you want something that can go from the high street to the back roads with easy, or it could be because you want something durable that’s suitable for the whole family, from the small children who you want to keep safe to the teenagers who you also want to keep safe but who don’t want to be embarrassed by an ugly set of wheels or an old clunker when you drop them off at school (and you wouldn’t exactly say no to something that makes the process of learning to drive easier for both of you!). However, as well as getting with that rugged edge, you want a touch of sophistication with a pedigree. This sounds like the 2012 BMW X3 would be just right for you. BMW has been part of the SUV and AWD drive scene for some time already, but the latest version of the BMW X3 is more or less a completely new car compared to the very first X3 that came out quite a few years ago. You can see the pedigree of the BMW X3 clearly in the tall, aggressive stance as well as in the smooth, crisp lines along the flanks and bonnet. The styling of the 2012 BMW X3 reaches even back even further in time with the headlights, rounded and doubled as they stare into the distance ahead of it. But there are those subtle touches here and there that remind you that this is indeed a car of today, and this is especially the case with the X-Line exterior design package that comes as standard on the BMW X3 xDrive 30d. This package includes satin-aluminium side window frames and front/rear bumper insets, plus a few other glossy bits and pieces. However, all models of the 2012 BMW X3 have satin-aluminium roof rails as standard, along with front fog lights. It used to be that the best cars managed to throw in six gears in the transmission system. Not any more. Today, engineers have worked out how to fit a few more gears in, which makes for even greater efficiency – something that has to be thought of even more these day compared to in the past. The latest BMW X3 has eight gears; in older versions, the only thing with eight gears on the BMW was the bike loaded onto the roof rails. When you think about it, it’s only logical that the 2012 BMW X3 has more gears than the older once, seeing as bikes have also increased the number of their gears for greater efficiency – the typical bike once had 10 or 12 gears but now most good ones have well over 20. Well, the bike loaded on top of your new BMW X3 might have more gears than the engine, but we all know that it’s what spins the cogs in the gears round that really counts. 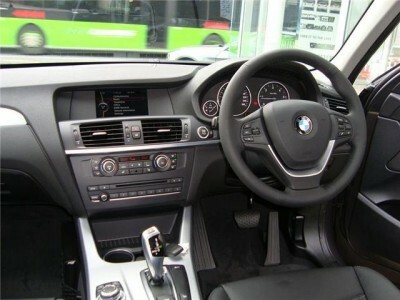 In the BMW X3, you have a couple of choices in this area, even though anything you pick will be able to run through all eight gears nice and smoothly using the automatic Steptronic gear shifting mechanism (they haven’t come up with auto transmission for bikes yet). You have a choice of fuel for a start – petrol or diesel? If you go for petrol, you’ve got two choices, both of which are 2-litre engine but one (the xDrive28i) is a bit nippier than the other (the xDrive20i). Both petrol engines are four-cylinder units with twin-scroll turbocharger with valvetronics, double-VANOS and high precision injection. If diesel is more your sort of thing, then again you’ve got two options: the xDrive20d and the xDrive 30d, with the xDrive 30d being the top of the line for the 2012 BMW X3. Both turbodiesel units have common-rail direct injection, but the xDrive 30d has six cylinders in its 3-litre engine while the 2-litre xDrive20d has four. It’s always fun to stack the variants up against each other, and doing this can certainly help when the time comes to take your pick. So which is the best 2012 BMW X3? In the 0–100 km/h stakes, the winner is the xDrive30d with 6.2 seconds, followed by the 28i (6.7 seconds), the 20d (8.5 seconds) and lastly the 20i (a pretty respectable 8.6 seconds, so you’ll hardly notice the difference between the 20d and the 20i). In the power and torque department, the winner is again the xDrive 30d (190 kW and 560 Nm), followed by the 28i with 180 kW and 350 Nm. After this, things get a bit trickier because the BMW X3 xDrive 20d has the same amount of power as the 20i (135kW) but the 20d has a shade more torque (380 Nm vs 350 Nm), which is what you’d expect from a diesel. And to take a completely different tack and to rank the 2012 BMW X3 variants according to fuel economy, the winner here is the xDrive20d, with a combined figure of 5.6 L/100 km, closely followed by the 30d with 6.0. The two petrol units are equally matched for economy, both yielding a combined figure of 7.5 L/100 km. However, you won’t notice much difference in ride comfort between the four, as they’re all set up on the same basic chassis and suspension which doesn’t vary from model to model, unlike a few aspects of the detailing and the bells and whistles. No matter what engine you prefer under the bonnet of your BMW X3, you can decide how efficient it’s going to be by using the Driving Experience Control, which you can set to super-efficient (ECO PRO), Comfort or Sport. ECO PRO mode also shows you your potential fuel economy on the dash display. Efficiency is also maintained with the Brake Energy Regeneration function. The double-joint spring strut front axle and the five-arm rear axle means that the 2012 BMW X3 remains comfy no matter where you go. And the full-time all-wheel drive with fully variable torque split between the front and the back means that you can take the BMW X3 quite a few places indeed. The chances are that you will be taking the BMW X3 out on the back roads a bit and into the hills. In this case, it’s good to know that one of the active safety features in the 2012 BMW X3 that you wouldn’t find on the older models is the Hill Descent Control, which keeps the car going at walking pace as you go downhill, no matter how steep the road is, and you won’t have to keep your foot on the brake the whole time (don’t go trying it on a sheer vertical drop, though – there are some things that the 17-inch (xDrive 20i and 20d) or 18-inch alloy wheels (xDrive28i and 30d) just won’t be able to stay on). Other active safety features that come as standard features in all variants of the 2012 BMW X3 are the Dynamic Stability Control package, which includes traction control, brake assist, ABS brakes and cornering control (a must in a tall AWD like the BMW X3); and the dynamic braking lights that deploy the hazard lights if you have to slam the brakes on. You will see the active head restraints that form part of the passive safety features of the BMW X3, and you should be putting on the three-point pretensioned and force-limited seatbelts, but hopefully, you will never have to see all the airbags (head airbags front and rear, side airbags for the front passenger and driver and your usual front airbags for driver and front passenger). 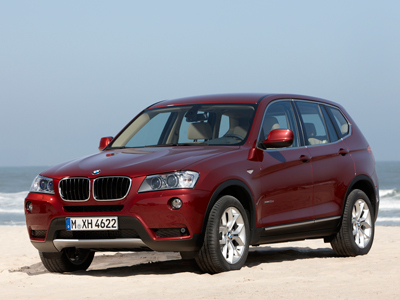 Nor should you see the deformation zones in action – the 2012 BMW X3 looks too good for that. A nice cockpit looks modern and is the centre of all the action. Standard features you’ll find in all variants of the BMW X3 are dual-zone climate control, cupholders all round, Bluetooth connectivity, a sport leather multifunction steering wheel, a handy pair of power sockets, cruise control, a rear view camera, park distance control front and back, and a six-speaker radio/CD sound system with USB input. Enough about the gloomy safety stuff and onto the fun bits in the BMW X3. If you were very picky, you could count the rain-sensing lights and the daytime running lights as safety features. I don’t really. Other standard features you’ll find in all variants of the BMW X3 are dual-zone climate control, cupholders all round, Bluetooth connectivity, a sport leather multifunction steering wheel, a handy pair of power sockets, cruise control, a rear view camera, park distance control front and back, and a six-speaker radio/CD sound system with USB input. In the xDrive20s (20i and 20d), the seats are trimmed with Sensatec artificial leather, but the xDrive28i and 30d have the real thing: Nevada leather everywhere, including the gear knob. The latter two models also have electrically adjustable seats with a memory function for the driver. The top of the line xDrive 30d also throw in the automatic tailgate opening function and a navigation system. Of course, there are dozens of options available to upgrade your 2012 BMW X3, including an M-Sport package. However, if I described these, we’d be here all day. Pick of the bunch of the options for this writer would be the heated seats and the glass sunroof. For any more information on the BMW X3, or for that matter any other new car, contact one of our friendly consultants on 1300 303 181. If you’d like some fleet discount pricing (yes even for private buyers! ), we can submit vehicle quotes requests out to our national network of BMW dealers and come back with pricing within 24 hours. Private Fleet – car buying made easy!